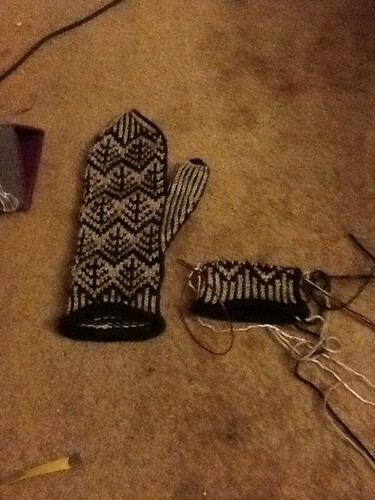 For the last few weeks at knit night I’ve been working on a pair of Douglas Mittens by emilyelizabeth. They are fun and since they are done in worsted weight they are super fast. I’m already this far after just a few hours of work. They’re sized pretty big, so if you have small hands I’d suggest going down to a DK weight and a smaller needle. These are for my dad… or maybe my uncle… some man I know with big hands anyway… they’ll sit in the Christmas box until December 20th when I finally will decide who gets them. That’s how I roll. I’m loving the big fat worsted weight colorwork stitches. Tami’s blog has more great WIPs. gorgeous! I can’t even imagine attempting something like this, though I really want to!! haha awesome, I love the mitts and I love how many projects you have going! they’re beautiful! isn’t delightful to work on something in a fine yarn and then return to worsted weight? the progress made in a short amount of time is fabulous! i love them! Nice! Those mittens have been in my queue forever. Very pretty! I love the colorwork. I love these; they’re definitely going in my queue. Are they knit with just two colors? The lighter color seems to have an ombre effect going on.